Another visit to L’Outa, for the willowy brunette a birthday. I could say that at times she can possibly be a picky eater, but that would be unfair. She only eats good food,almost no rubbish,by her own admission she does not go out of her comfort zone as far as food is concerned, having said that, snails for example are a hit! So once again, we had an amuse Bouche of the cream vegetable soup, again very acceptable . 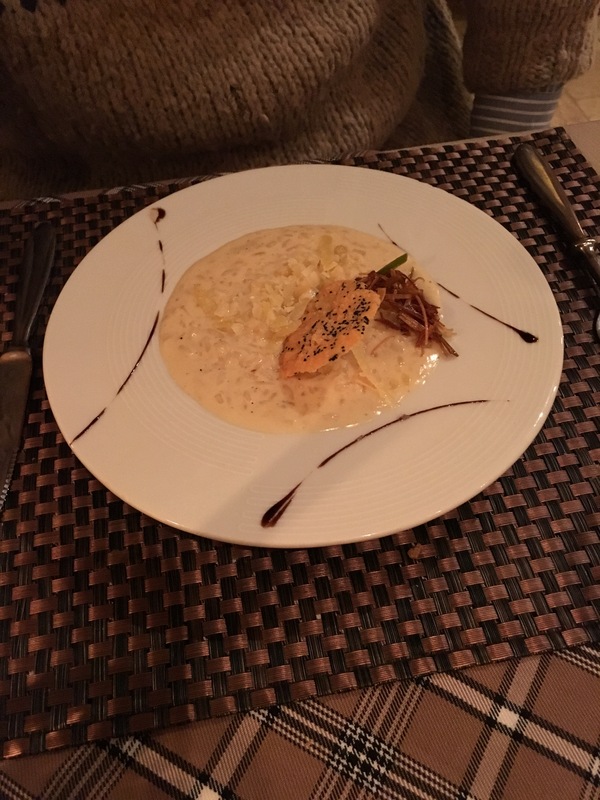 For our starters, the three of us chose a risotto , albeit three different ones. 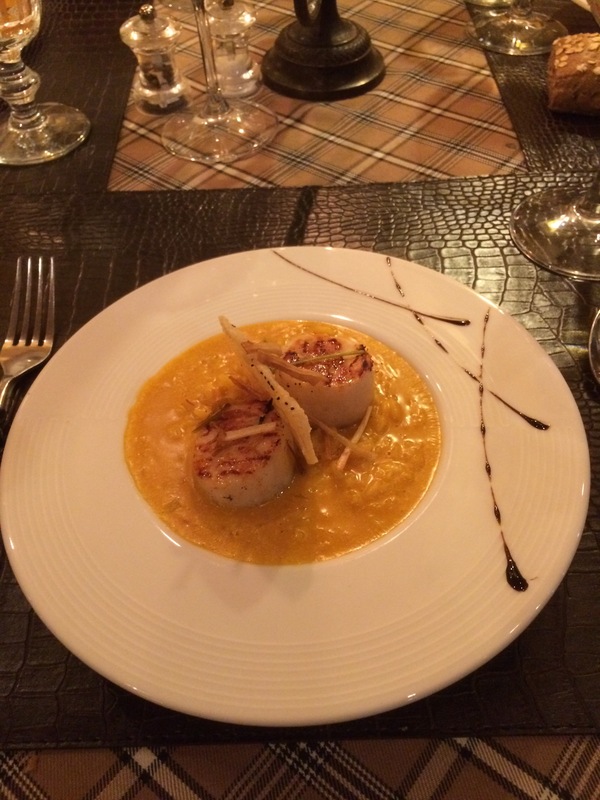 A risotto au fromage, a risotto with scallops and a risotto aux cepes. All arrived at the same time, all were perfect and all were al dente. And as they were three very different risottos, they had been cooked seperately. 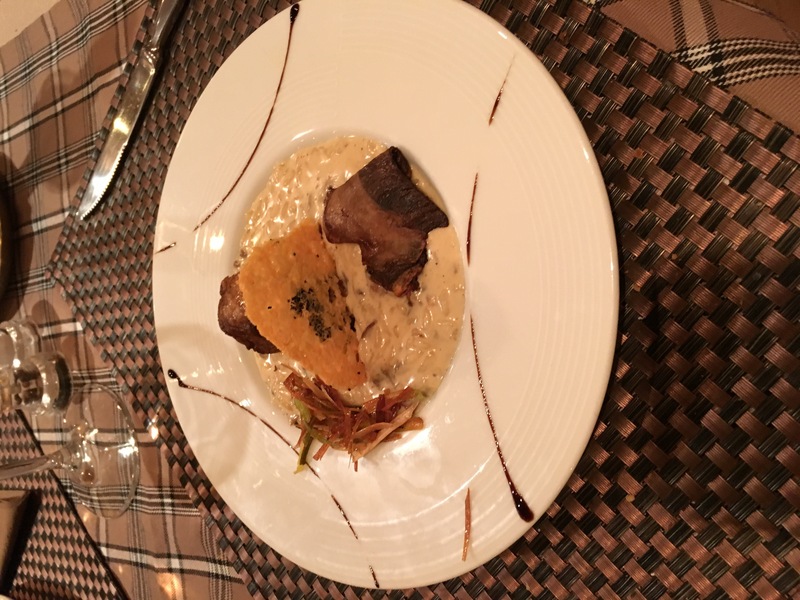 All three Risotto were served with a Parmesan crisp, which are very easy to make, but add a very nice finishing touch. 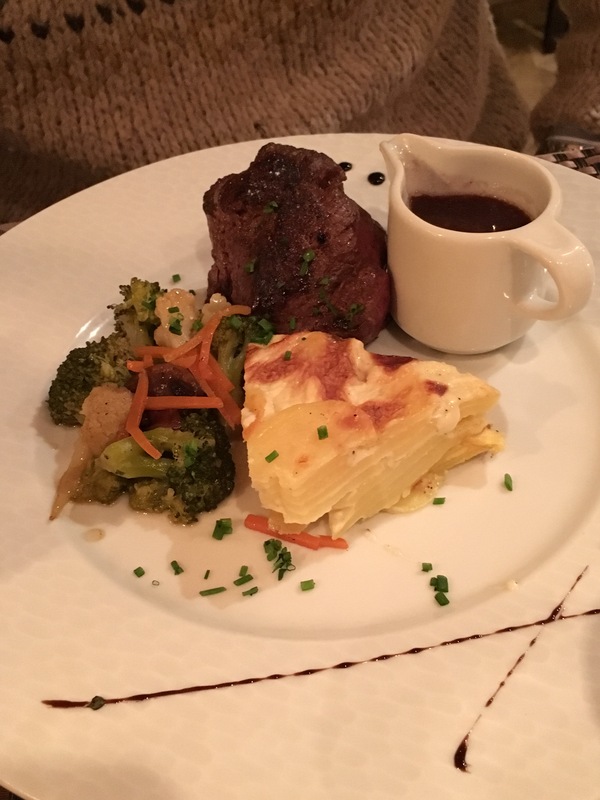 For mains, Himself chose the beef whilst the girls went for the Gambas, which I have to say were wonderful , having had ‘Food Envy’ on the previous week, I was very pleased to have chosen them this time round. Filet of Beef au Jus, dauphinoise potatoes. The birthday girl had the café gourmand, which although it was as copious as the previous week, it was in fact different, with a mini tarte au citron, a mini lemon meringue pie, some type of caramel pudding with a runny middle, a passion fruit mousse, a coated profiterole with chocolate filling and another with sorbet cassis, and a cookie! It also came with a birthday sparkler! 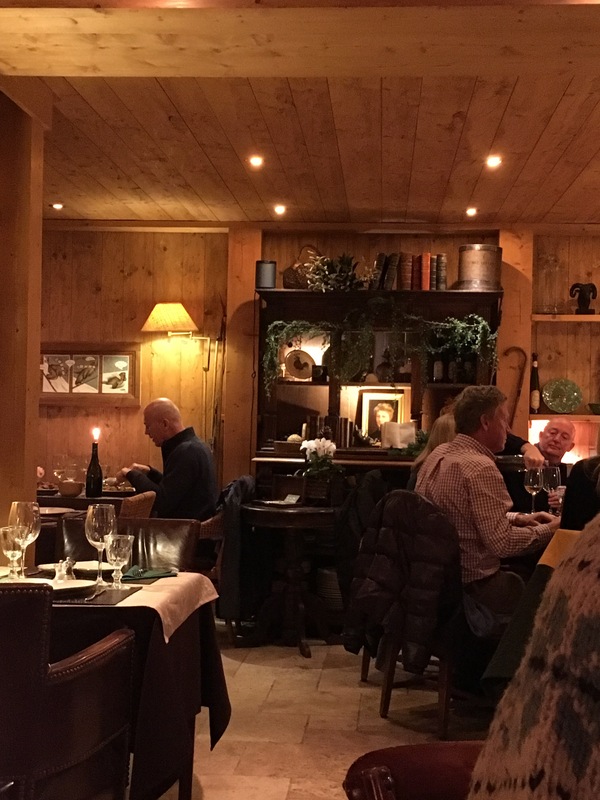 It was a Thursday night and I did a head count, 40 people and a few extra tables around the corner, not bad, as it certainly does not cater for the average skier or tourist. Come summer we will return. However I commented to Madame that they were not on Twitter, no, she replied but in the guide Michelin. A strange phenomomen , I looked up Guide Michelin, it directed me to the web site, which then promptly told me that as my app. account is UK based, I could not access it, but redirected me to the UK site. And Guess what the App is not available in the UK, Catch 22 I guess! 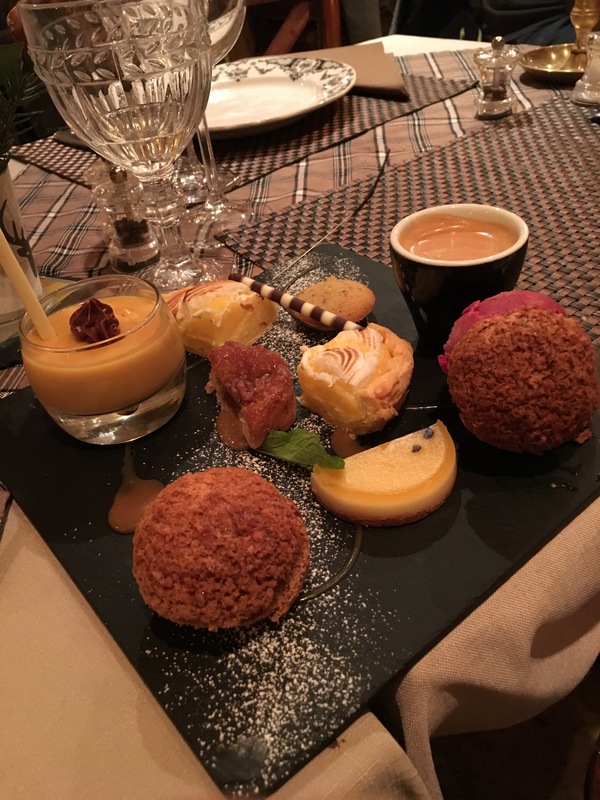 A fine dining restaurant in Les Gets! Having said previously ( and several times) that here in the mountains, most restaurants serve, Ham, Cheese, Potatoes, cream and Charcuterie, and understandably , they cater to the tourists. However we do not consider ourselves, tourists ?semi residents, if you like, as we even get resident discounts on the ski lifts . So, there is one restaurant that fits the bill, as being not the usual run of the mill and it is L’Outa, in Les Gets. When we first saw the restaurant, we thought it to be a very smart antique shop, refined old pine fittings and soft lighting. But we were wrong, it is a lovely smallish restaurant, with about 30 covers. It also has a wine bar, ( yet to be tried) and a salon de thé ( also yet to be tried) . It is owned and run by Jaqueline and Phillipe François ( I think he could be the chef), she is the front of house and head waiter, and slightly dotty. One time when we called, to ask if they were open, Madame responded, oh I don’t know, call again in the morning ( I have to admit it was out of season). So we have been there now, several times, both winter and summer and out of season . In the summer we eat outside in the garden and in the winter of course inside where it is warm and cosy , we have never been disappointed. So, we went again, with new acquaintances,( she being French, him English) who had not been before and hopefully they will return. we chose, between us, a soup du jour, which was creamy winter vegetable with a cream and lard chantilly, Lard? Yes whipped cream mixed with lard! Spends awful, but in fact I would never had guessed that ingredient, on a blind tasting test! 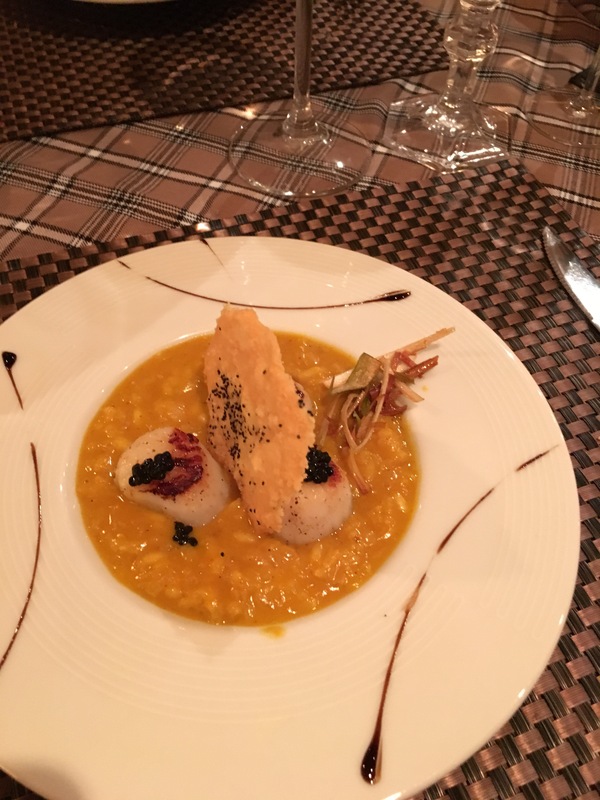 a scallop risotto and escargot served in a small casserole with fois gras and chanterelles. when I saw the Gambas arrive. I am hoping they will still have that on the menu, when we go again next week! No room for dessert except, our young skinny friend who chose the Café Gourmand, which was more than enough for two and her husband duly helped out. So chatting to Madame before leaving, she said, “bones vacances” I informed her that our young friends worked here! Oh she replied that is why she speaks such good French! I am French, was the reply! But Madame was nonplussed by this! Of course, as I said she is a bit dotty! But very nice all the same! Here in the heart of Les Portes du Soleil on the Swiss/ French Alps border, is the town of Morzine, which, was one of the pioneering ski areas of the 1930’s. A pretty enough town mostly built on the surrounding hills overlooking the town with views up to Avoriaz, a purpose built resort with ski areas up to 2,400 m. From the distance the resort blends well into the rocks and mountain but close up it is really quiet ugly. Back to Morzine, these days it is more than a ski resort, hosting in the summer “Harley Days” where the town is swamped by about 3,000 Harley riding bikers, the Tour de France and do not forget the hordes of mountain bikers, who use the ski lifts ( which have been adapted) to get up the mountains with their bikes, only to descend at break neck speeds, looking more like Darth Vader, than humans. It is not unusual to see, people hobbling around in casts and on crutches in winter and summer alike. Morzine is close to Geneva, and hence is accessible to many Europeans and especially the Brits! A whole industry has arisen to cater to them, from catered chalets, to laundry services, to builders, to real estate agents and even to a Tesco delivery service! Restaurants abound, serving predominately mountain food and of course pizza. 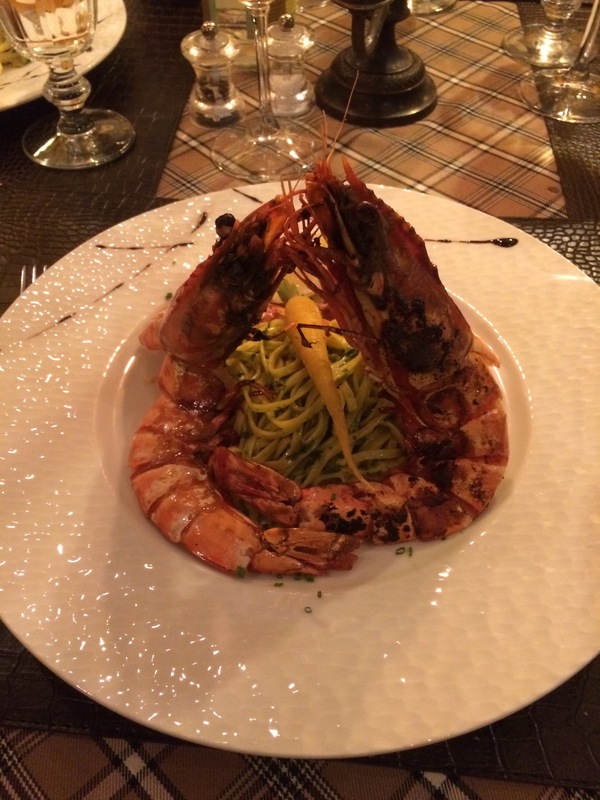 Chalets give their staff one night a week ‘off duty’ and so the guests descend upon the restaurants en mass. As I have said before Mountain food is variations on a theme, cheese, ham, cream, charcuterie, including Cheese fondue, cheese raclette , croute au fromage, platters of charcuterie, etc etc. 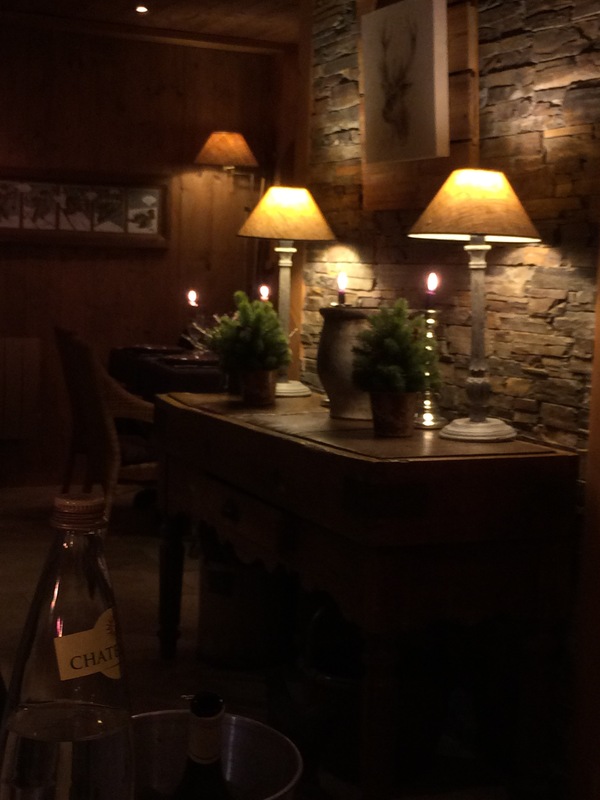 However one restaurant we we do frequent above others, is La Grange in the center of Morzine itself. It is run by a young Anglo French couple, Alex and Fred. They have been open for about 8 years and so far so good. When we visited the other night, a Tuesday, we were amazed at how busy they were. One party of about 20 walked in whilst we were there. I think they must have had 100+ covers that evening. As with most restaurants their menu is for serving the tourists , so lots of chees, ham , charcuterie and cream. 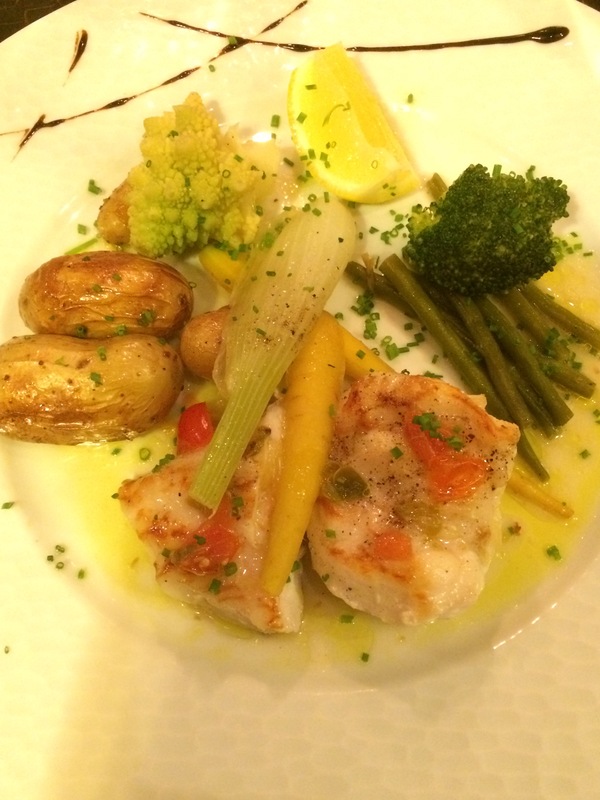 However, they do have other offerings, such as local lake fish, wild boar stew, steak and salmon trout from the local Ardoisières valley fish farm. Sometimes, they do a very good Steak Tartare, though sadly not that often. 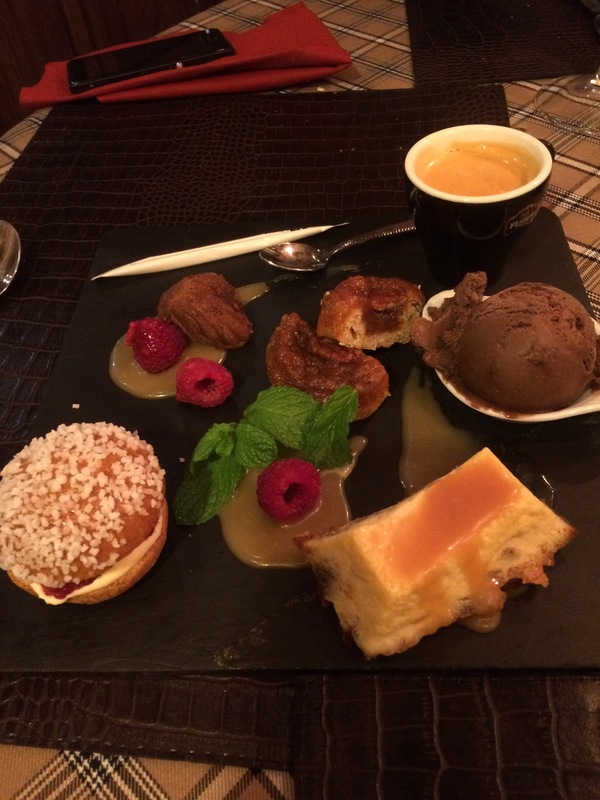 The one thing that we really enjoy when going there is the Tarte au Fromage d’Abondance. Abondance is a ‘ controlled named ‘ cheese from the Savoy region.It is made from semi skimmed milk and made into 10 kilo rounds. 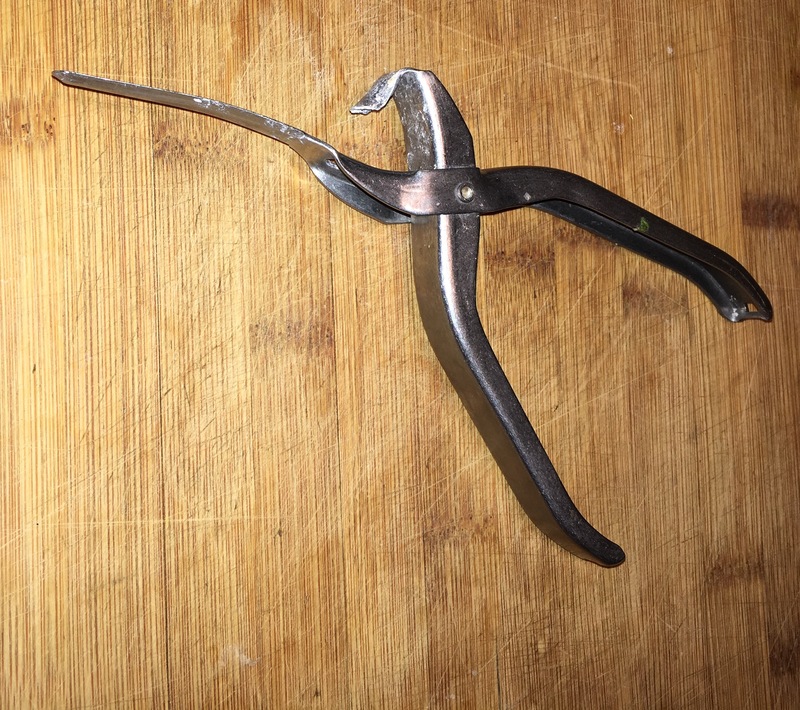 It is a very similar cheese to Gruyere but has a buttery, nutty flavour. 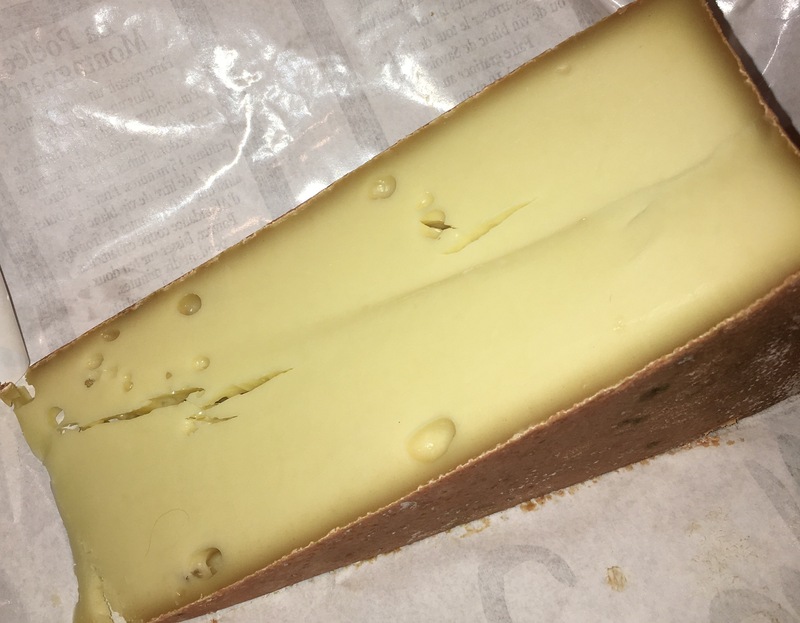 It is semi hard and melts very nicely, which makes it ideal for cooking and can also be a substitute for Raclette cheese.. Here in the Savoy , it costs between 11€ and €18 a kilo, but in the UK it can cost as much £35( la Fromagerie in Marylebone for example). So I have been experimenting in making this delicious Tart. 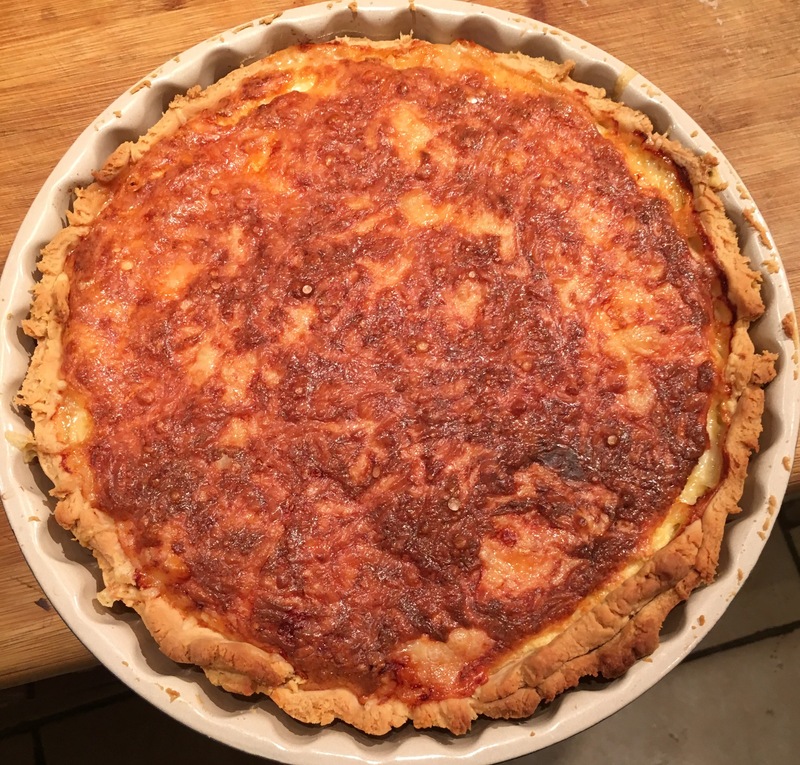 And it is not a quiche. 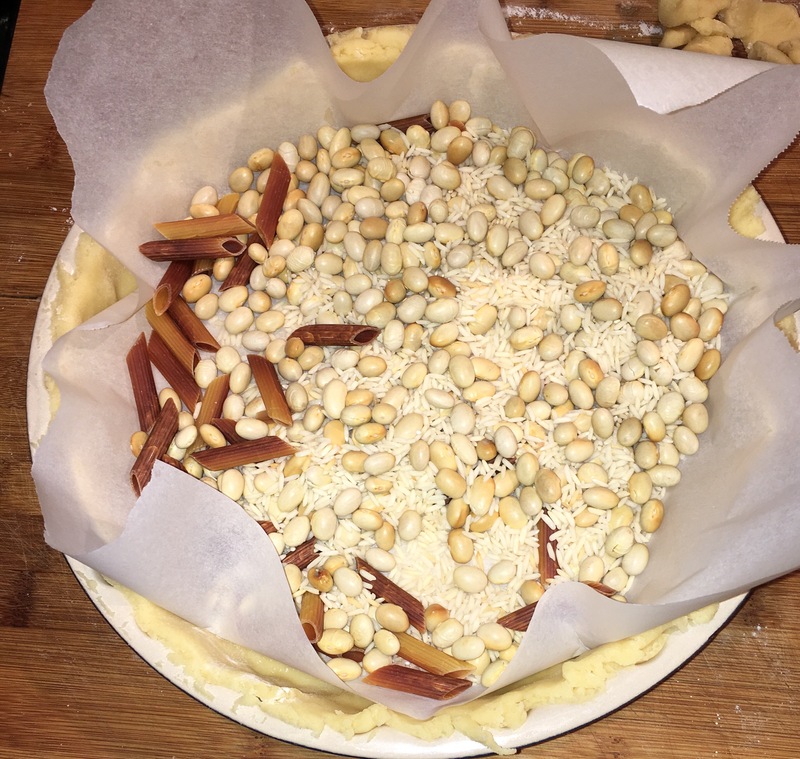 So to make this tart, you need enough pastry to line a quiche pan, I used a 12″ pan and pastry using 8 Oz flour you can use your favourite recipe or even buy some ready made, but not any type of puff pastry. Roll out the pastry, thin enough to line a quiche pan, but not too thinly. Trim the top edge and prick the bottom of the pastry to prevent it from rising. Line the pastry with some baking paper. Fill this with some form of baking beans. You can buy ceramic baking beans but you can use rice, noodles, dried peas ,beans etc. Bake at 200 C for about 15 mins only so just a little pre baking. Remove from oven and remove the paper and beans. 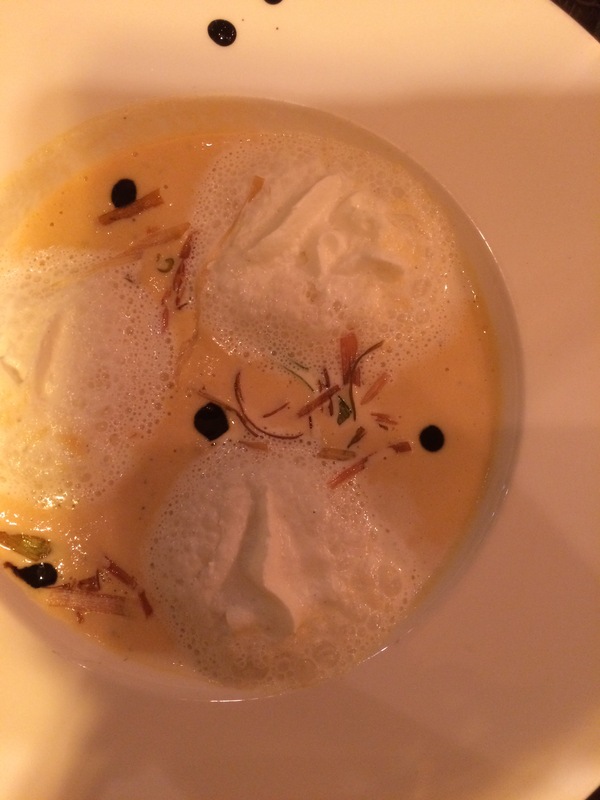 Whilst the pastry is in the oven , whisk together the eggs and the Crème Fraiche . Season with a sprinkle of salt and pepper. Spread the grated cheese over the pastry case evenly and spoon over the egg Crème mix. Return to the oven and bake for about 45 mins until the top is a golden brown. Remove from oven and leave to cool a little. It is best served warm but not hot. Could be served with some buttered new potatoes or a simple green salad. As I have said before, our normal Christmas dinner, is not normal, and is perhaps not for everyone, as in principle I do not cook on Christmas Day . And this for someone, who just has to cook, is a bit of an oddity. However, Number one son and his bride also love to cook. NBG is more of a cook and Mrs. G # 7 ( I have lost count, so numerous are we) is more of a baker. So they complement each other well. 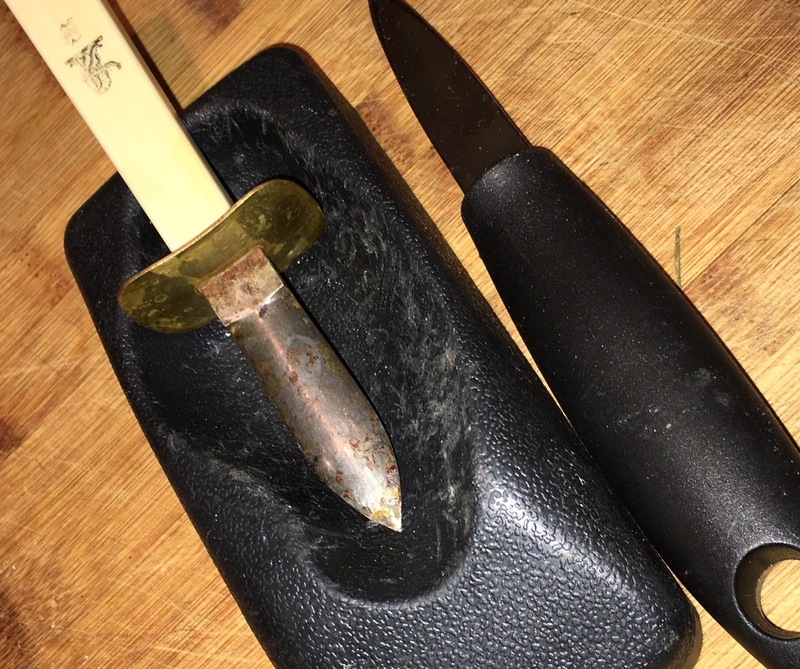 So off to market I went and returned with 4 dozen oysters and it was decided to make Oyster Rockefeller , NBG got to grips with the shucking and cleaning of the shell, ( so no bits of shell were left with the oysters…….. Very Master Chef here). 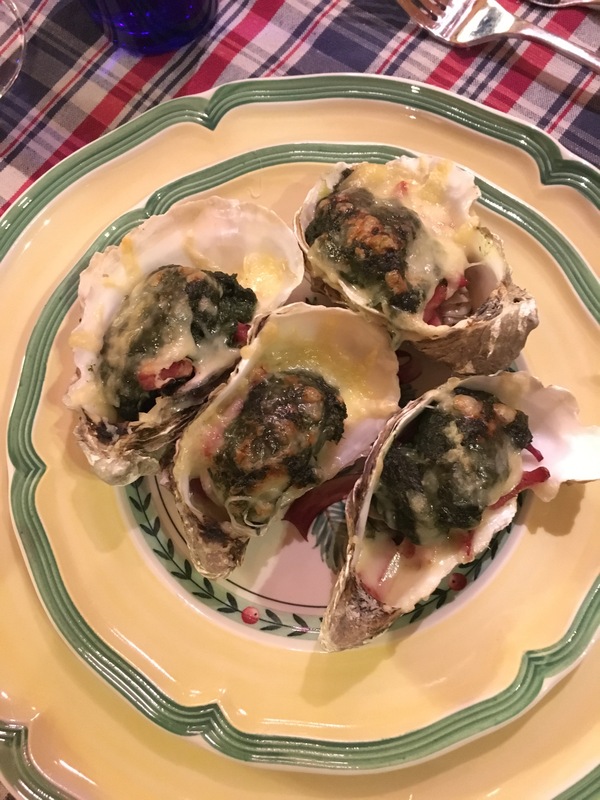 Actually Mrs. G7 commented that she had never heard of Oysters Rockefeller until she watched ” Master Chef, The Professionals” ( British Version, ) when one of the Skills test was to make them, one of the classics that these chefs, need to know. Researching all things Oysters, I came up with as many variations of Oysters Rockefeller as there are cookery books on Oysters. For Starters, it is claimed that the original was created by a chef working in Antoines restaurant in New Orleans, Louisiana, in the late 1900’s.Someone,dining there declared that they were as rich as Rockefeller! Not surprising really as a) New Orleans is on the Gulf coast of the USA, where Oysters, Shrimp ( read very large ones) , Crawfish and Soft shell crabs abound, and b) the home of good food in the USA, or should I say rich food, not necessarily all good, lots of fried food, but having said that, Oyster Po-Boys are one of my favourites. So back to Oysters Rockefeller , the version outed on British master chef included a small shallot, cream, nutmeg and egg yolks. Others include chopped celery, bell peppers, spring onions, parsley, dry breadcrumbs, bacon, watercress, herbs such as marjoram, basil, black pepper, Herbsaint, Tabasco and Worcestershire sauce. The three things that they have in common, are onions ( normal, shallots, or Spring ) spinach and of course Oysters! The master chef version simmered the oysters in their juices for a very short period of time, though looking in my Louisianan books I find nothing of this, but as I have said, there are many options here. 1/2 pkt frozen spinach, ( defrosted and well drained) of course you can use fresh but you will have to cook and drain it before use. 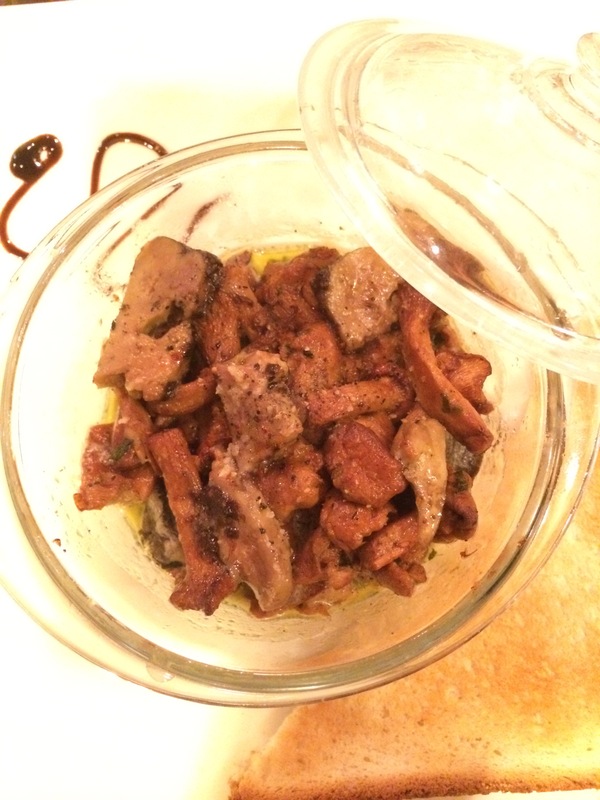 Dash of Tabasco and 1/4 tsp Worcestershire sauce. Melt the 4 tabs butter and sauté the onions, add the spinach and cook for a minute or two to heat through. Add the breadcrumbs,bacon,Tabasco and Worcestershire sauce. Mix in the rest of the butter.Taste and adjust the seasoning to your taste. Arrange the oysters shells on a baking tray so that they do not tip over. Put the oysters in the shells and put a teaspoon of filling on each and top with the grated Parmesan ( if using). Bake for 10 mins @ 450F/230C/Mark 8. Serve piping hot with warm crusty French bread. Eldest daughter was eating oysters at the age of two, though I have to admit that she promptly threw up, but Hey Ho, she loves them now. Have not tried them on her brood as yet, though I suspect that” Truly Scrumptious” would love them. It is a pity that in the UK they are now fairly expensive, once upon a time they were the food of the poor, but now? Another joy of Oysters is that they can be grilled over charcoal and will open by themselves! Joy!And Enjoy!